Manager Mickey Callaway confirmed Sunday that Conforto will play exclusively in right field in 2019, Anthony Rieber of Newsday reports. Callaway noted that the decision stems largely from a desire to have Conforto get comfortable at one position right away this season rather than having to shift him from left field to right once Yoenis Cespedes (heels) is ready to return later in the campaign. Conforto also made 58 appearances in center in 2018, but graded out poorly as a defender and isn't expected to be used there for anything more than emergency purposes with Brandon Nimmo, Juan Lagares and Keon Broxton all on hand. 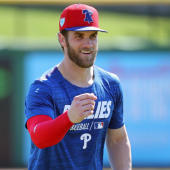 The 26-year-old likely won't be heralded for his defense in right either, but he'll carry plenty of appeal for fantasy purposes after busting out for a .273/.356/.539 slash line and 17 home runs in the second half last season once he was further removed from shoulder surgery.